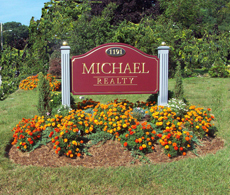 Meet the Staff Michael Realty has been serving Kent County and surrounding areas for Over Thirty years. Our brokers and sales associates have not only been in the business for Many Years, but are long time area residents. This gives them not only the extensive experience that you need in the professional who helps you buy or market your home, but also provides you with an informed individual who knows the area As Only a concerned resident can. whether buying, selling, or relocating--please give us a call or stop by our office--we are centrally located at 55 Nicole Drive, West Warwick, RI.